Ugadi ushers in a celebratory mood in the states of Karnataka, Andhra Pradesh, and Telangana. For the people of these states, Ugadi symbolises the beginning of the New Year as per the Hindu calendar. It is an occasion that is traditionally celebrated with day-long festivities. People undertake new ventures during Ugadi as it is considered to be an auspicious time for doing so. 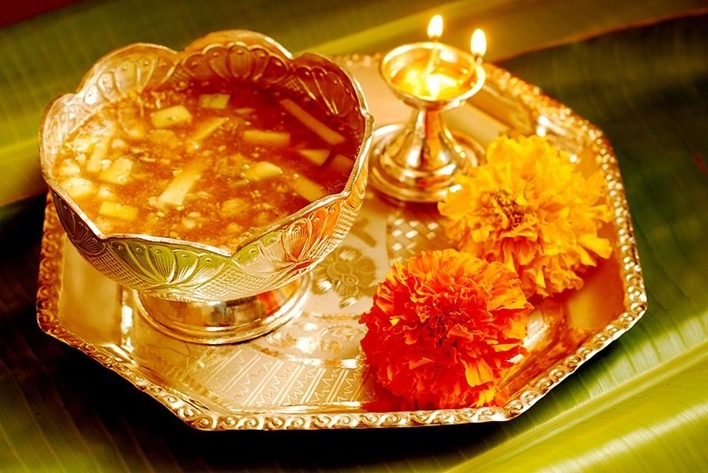 Ugadi is believed to have originated from the Sanskrit word Yugadi. The term Yugadi is the merger of two words, Yuga (meaning period or age) and Adi (meaning the beginning). So, Ugadi or Yugadi literally translates to ‘the commencement of a new period or new age’. According to popular beliefs, Ugadi has an age-old association with mythology. Legend has it that Lord Brahma began the creation of the universe on the Ugadi day. He then went on to create days, weeks, months, and years in order to keep track of time. Thus, Ugadi is believed to be the first day of the creation of the universe. The occasion of Ugadi holds a lot of significance in the lives of the people, which stems from ancient beliefs and practices. The fact that Ugadi is still celebrated with so much fervour and enthusiasm goes on to show its relevance even in today’s time and age. Spiritual Significance of Ugadi: Since it’s believed that Brahma started the creation of the universe on this auspicious day, Ugadi is celebrated to acknowledge his work. One of the names of Lord Vishnu is Yugaadikrit, which means the creator of the Yugas or ages. He is worshipped on this day for this reason. Astronomical Significance of Ugadi: As per the lunisolar calendar, Ugadi marks the day on which a new astronomical cycle gets into motion. The tilt of the earth enables the northern hemisphere to receive the maximum amount of sunlight for a period of 21 days that starts on the Ugadi day. It signifies a period when the earth starts to recharge itself for a new beginning with the help of Sun’s energy. Ugadi marks the start of the earth’s energising period. Significance of Ugadi in Nature: It is the time of the year that heralds in the spring season. With the advent of spring, Mother Nature wakes up from her reverie and gives birth to new shoots, leaves, and plants. A blanket of greenery starts to cover the earth and everything in nature seems to adorn a new look. Ugadi marks the regeneration of Mother Nature. The spring festival of Vasanta Navratri also commences on this day and continues for nine days before concluding on Ram Navami. Psychological Significance of Ugadi: A fresh beginning is the essence of human life as well as the occasion of Ugadi. Just as the trees and plants unfurl new leaves during spring, Ugadi marks the unfurling of new hopes and expectations in human lives. The occasion is all about leaving behind the past and starting anew with fresh expectations and a positive frame of mind. Ugadi not only signifies the start of a new year, it also signifies the beginning of a new phase in a person’s life. A lot of preparations are carried out to celebrate the festival. The preparations generally begin a few days in advance. People clean and wash their houses for the occasion. New clothes are bought to be worn on that day. To celebrate the spirit of Ugadi, several other items are purchased and kept ready by the people. They make preparations for the special cuisines to be cooked on the day. The celebration of Ugadi is marked by enthusiasm and cheerfulness. On the special day, people wake up before sunrise and get ready after taking a ceremonial oil-bath, as it is a prevalent custom for Ugadi. Even the idols of gods and goddesses are given an oil-bath on this day. Family members dress up in new clothes and gather to worship and pray together on this day. Prayers are offered to the Sun God before consuming Bevu Bella, a dish that holds much significance in Ugadi celebrations. People visit temples to make offerings and seek blessings from the Almighty and start the New Year on a happy and positive note. Special dishes are cooked for the occasion and enjoyed by families. Sweets and eatables are shared with friends and neighbours. An important aspect of the occasion is the Panchanga Shravanam or hearing of the Panchanga. It is read by the priests at the temples or by the eldest member of the family at home. On this day, based on the moon sign, predictions and annual forecasts for the New Year are also made by the learned pandits and astrologers. Many new ventures are started on Ugadi. People commence the construction of their new houses, undertake new business endeavours, make important purchases, and sign deals on this significant day. On the occasion of Ugadi, people lay emphasis on preparing a special dish that incorporates the six different and distinct flavours of life. This dish is called Bevu Bella or Ugadi Pachhadi. Bevu means bitterness and bella means sweetness. This dish is made from a mixture of neem flowers or buds, tamarind, chilli powder, unripe mango, salt, and jaggery. It is the first dish to be had on the Ugadi day. So, the dish has all the flavours, starting from bitterness and ending in sweetness. Bevu Bella denotes that life is a mixture of different experiences, emotions, and events that one must learn to face bravely. Each member of the family tastes this dish on Ugadi. Apart from Bevu Bella, several other dishes are prepared to celebrate the festivities on Ugadi. Holige and puliogure are two popular dishes of Karnataka that people cook and relish on Ugadi. Thus, the festival is celebrated to welcome a new start in life every year with the expectations of happiness, well-being, growth, and prosperity.